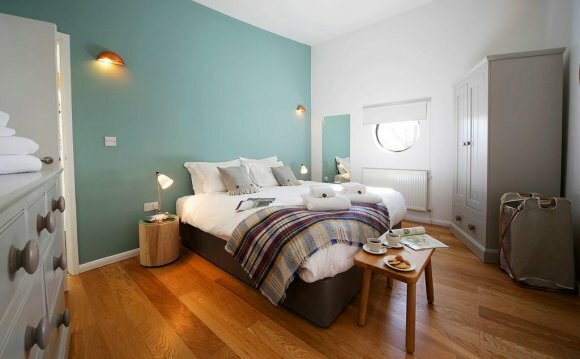 Natural Retreats Yorkshire Dales is set amongst 54 acres of pristine countryside in Swaledale, just a mile from the historic market town of Richmond, right on the edge of the Yorkshire Dales National Park. With its rich green hills, ancient forests and rivers and streams the Yorkshire Dales a truly idyllic location. The recently refurbished 18 Natural Retreats residences are of award-winning design and offer the perfect base for self-catering holidays in this stunning area. The modern open plan living area and stylish furnishings offer enviable levels of luxury and comfort and each Residence boasts solid wooden floors throughout, a wood burning fire and a state of the art kitchen complete with everything you may need whilst you’re away. All guests receive a complimentary welcome hamper on arrival filled with delicious local produce and wine. Guests also have access to the Natural Retreats Concierge, a team of dedicated travel professionals who can tailor make your holiday experience, providing advice, expertise and experience for you to call on before, during and after your stay. The Natural Retreats residences blend neatly into the hillside causing minimal visual impact, and with extensive glass wall frontage, they are designed to bring the natural light, surrounding woodland and meadows directly into the home. Being on the doorstep of the National Park allows guests of Natural Retreats instant access to this wonderful living landscape. The Yorkshire Dales National Park is much more than just a series of stunning views. Brimming with rich history, tradition and nature, as well as awesome geological features, it is an outdoor classroom, just waiting to be discovered. Each Residence has three bedrooms and can accommodate a maximum of six adults – the size and makeup of the bedrooms varies across two styles of residence. Half of the residences boast a large master bedroom with en suite shower and wet room as well as two slightly smaller double bedrooms. These two rooms share a large family bathroom together with bath and shower. The other nine residences also offer three double bedrooms, each of which has an en suite shower room and WC. Across all of residences there is a bedroom which can be made up as a twin for children with adjoining zip and link mattresses, perfect for younger guests yet offering a full size double as requested. The comfort and well-being of Natural Retreats’ guests is always front of mind, hence the installation of flat screen TVs, Wi-Fi, DVD and CD players and even PlayStations! The residences also have fully equipped kitchens which include microwaves, washing machines and dishwashers. The first ever National Trust Puffin Cam!